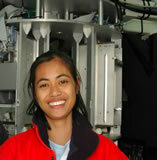 Vinya Agluba was born and raised in Philippines, then immigrated to Hawaii with her family in 2003. She is now a senior student in University of Hawai’i at Manoa pursuing a Bachelors degree in Electrical Engineering. She is interested in electronics, and solid state devices. Just recently, she took an antennas course and enjoyed it too. She likes to explore and learn new things. Achieving the maximum illumination efficiency and holding the net loss (to ten percent or less) are two of the functional and performance requirements that the Sub Millimeter Array (SMA) optics must satisfy. The maximum theoretical illumination efficiency can be made as high as 87% with minimal variation across each receiver band. The net loss could be due to factors such as beam truncation, distortion at focusing mirrors, and absorption and reflection at windows and mirrors. The beam waveguide mirrors located inside the cabin consist of four mirrors M3-6. This project attempts to satisfy these requirements by aligning the mirrors from the sub reflector to mirror M6. To align the mirrors, a dual beam laser will be placed between mirrors M4 and M5 on the 4-5-6 plate and generate a laser beam that will travel through all the mirrors. Since mirrors M5 and M6 are accurately aligned, these mirrors will be used as a reference for the alignment of the laser. Mirror M4 is not an optical grade mirror and disperses light, so an aperture stop is used to block the dispersion and only allow light that has the maximum power. A video camera will be positioned on the vertex of the reflector to inspect the amount of change that the laser beam propagated on the sub reflector would have as the antenna points from upward to sideways. With the alignment of mirrors using a dual beam laser, it is expected that the maximum illumination efficiency will be achieved and losses will be reduced.